70 7/8 by 47 1/4 in. 180 by 120 cm. 26 9/16 by 23 5/8 in. 67.5 by 60 cm. 48 by 33 3/8 in. 121.9 by 84.8 cm. 48.03 by 33.46 in. 122 by 85 cm. 51 by 34 in. 129.5 by 86.4 cm. 50.79 by 34.06 in. 129 by 86.5 cm. 23 by 27 1/2 in. 58.4 by 69.9 cm. 74 1/8 by 53 3/4 in. 188.3 by 136.5 cm. 25 1/4 by 23 3/4 in. 64.1 by 60.3 cm. 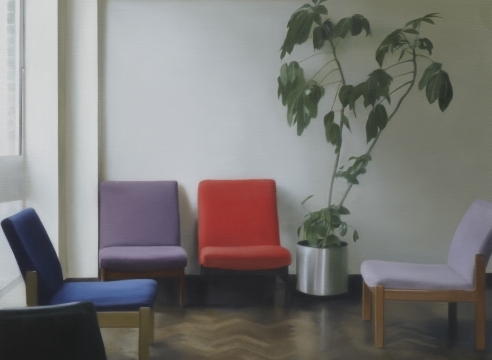 Mitchell-Innes & Nash is pleased to present its second solo exhibition of British painter Paul Winstanley. The exhibition features a dozen new paintings that continue the artist’s career-long engagement with the relationship between painting and photography. Hovering between the mundane and the dreamlike, Winstanley’s images tease out beauty from the generic spaces of modern life. Painted from photographs – in most cases the artist’s own – the new paintings deal with private psychology in public spaces: a phone conversation in a hushed park enclosure; a passenger asleep in a train; a man waiting inside his parked car. His subjects are quotidian but psychologically fraught, filled as they are with an almost cinematic sense of impending action. He captures liminal moments from a point of view that borders on anthropological: the artist’s position is one of cool distance. Winstanley has long been interested in a particular moment in English post-War architecture: a generic modernism that displays a somewhat dreary interpretation of a utopian vision. Serial images of obscured windows, waiting rooms, and empty walkways have been ongoing subjects for the artist throughout his career. In this new body of work Winstanley moves away from repeated imagery, focusing less on the mechanics of photography than on the image itself. Born in 1954 in Manchester, England, Paul Winstanley lives and works in London. He was educated at Lanchester Polytechnic, Coventry, England; Cardiff College of Art, Wales; and the Slade School of Fine Art, London. Winstanley has exhibited throughout the U.S. and Europe. His first retrospective at the Auckland Art Space in New Zealand in 2008 was accompanied by a fully-illustrated catalogue. Winstanley has been included in group exhibitions at the Kunsthalle Hamburg (2011), Irish Museum of Modern Art (2009), Museum of Contemporary Art, Los Angeles (2008), The Renaissance Society, Chicago (2002); and Tate Gallery, London (1998). His work is in the collections of MOCA LA, IMMA, the Tate, and the Colby College Museum of Art, Maine, among many others. He has had recent solo exhibitions at Vera Munro, Hamburg, 1301PE, Los Angeles, and Kerlin Gallery, Dublin.